How to identify constipation in toddlers before it becomes a problem. Understand what causes toddler constipation and learn natural solutions to prevent and treat it. Before having children, you probably never imagined that you could get so worked up about what comes out of your toddler’s fragile rear-end! From observing food swallowed whole to watching for that unmentionable object your child swallowed before you could get to him/her, it is easy to become obsessed with the contents of the toilet. While toilet accidents and contents can consume us, nothing is worse than when the bowel remains empty day after day. Worse yet is watching helplessly as your child cries while trying to expel an overly large, compacted stool caused by toddler constipation or fear of constipation (if they have had painful bowel movements in the past). Here we will discuss HOW to identify constipation in toddlers before it becomes a problem as well as WHAT causes it so that you can apply natural solutions to PREVENT your toddler from becoming constipated. The American Academy of Pediatrics defines constipation in toddlers as any child with stools that are large, hard, dry, accompanied by painful bowel movements, soiling between bowel movements, or with blood on the outside of the stool. How can you tell if your toddler is constipated? Ideally, children should have at least one bowel movement a day. Their bowel movements should be soft and flexible, not hard and compacted. If your child is not having a bowel movement each day, you should take steps to ensure he or she does. Feces building up and stagnating in the large intestine should be avoided by everyone, not just toddlers. Most toddlers following our healthy diets for kids (coming soon) will have 2-3 soft, easy to expel, bowel movements per day. Unfortunately, the American diet is so poor that many children have fewer than three bowel movements per week. While the occasional bout of constipation is perfectly normal once in a while, we are meant to have a daily bowel movement. If your toddler isn’t, then there are several things you can do to get your child back on track. Let’s talk about what causes constipation in toddlers so you can take steps to prevent it. The number one cause of toddler constipation is poor diet. Children are meant to eat plenty of meat and vegetables accompanied by healthy fats. They should also consume whole fruits and properly prepared grains. A diet that has processed foods and too many sweets will often cause constipation. Dehydration causes stools to be harder and more painful to pass. When it is hot, it is especially important for you to ensure your child is getting enough fluids. If your child has already passed a painful stool, he or she may develop a fear of having a painful bowel movement and start actively “holding it”. You can tell if this is happening because your toddler will start actively avoiding going to the restroom and you may see him/her clenching his/her buttocks. Other toddlers are more interested in playing and will hold bowel movements instead of missing out on the fun. When going thru an especially rebellious patch, some toddlers will express their control over their own bodies by refusing to go. Traveling and being away from their normal toilet and routine can also cause toddler constipation. Others will be reluctant or embarrassed to use unfamiliar restrooms and start holding it (see above). Physical activity encourages the movement of food thru the digestive tract. When children are excessively sedentary, the simple lack of movement can cause constipation in toddlers. Changes in appetite due to illness can affect your child’s diet and lead to toddler constipation. 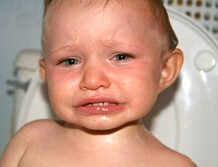 Fevers can cause dehydration (see above) also making your toddler constipated. More children are taking medication than ever before. Many medications can cause constipation in toddlers. Supplements like Iron can also cause your toddler to be constipated. If your toddler is constipated, it is important to be proactive and make changes. Constipation is easily preventable should be viewed as a sign that changes need to be made to improve your child’s overall health. Not only do we suggest you try the following when your child becomes constipated, we suggest you incorporate the following into your life proactively to improve your toddlers overall health. Not only do these recommendations apply to your toddler, but they will benefit your entire family. Your toddler’s diet should comprise plenty of grass fed meat, organic vegetables and fruits and properly prepared grains. Interestingly, by following our healthy eating guidelines, and by ensure our own children get plenty of fluids, we mothers at Natural Parenting Advice have not had children with constipation. Although we haven’t experienced toddler constipation personally, we have “converted” many friends and family members over to a more traditional and nutritious diet by solving some serious constipation problems! For more information read our healthy eating guidelines. Toddlers also need plenty of fresh filtered water to drink every day. Other excellent choices of fluids include coconut water, raw milk, and smoothies made of whole milk plain yogurt with fresh fruit (strawberries, blueberries, etc). For more information about the many benefits of raw milk visit A Campaign for Real Milk. Serving soup made with homemade broth is an excellent source of fluid, particularly if your child is sick because it contains lots of great gelatin to settle his/her stomach as well as fluid and minerals in a super absorbable form. Read Nourishing Traditions by Sally Fallon for how to make homemade broth. Most canned broth is full of MSG (labeled as “natural flavors”) and should be avoided. Sugary drinks and fruit juice shouldn’t be consumed because they will ruin your child’s appetite for more nourishing food choices at the same time they cause a myriad of health issues, including the suppression of white blood cell (immune) function. For more information including lots of great references about why children should not consume sugar, read Zapping Sugar Cravings by Jean Allbritton, CN. Make sure that your toddler gets outside to play for at least 30 minutes a day. An hour or more is ideal. If the weather is bad encourage your toddler to run around inside or take him/her to an indoor play area or class like Gymboree or Little Tykes Gym. One of our favorites is to put on the music so the whole family can dance! Tag, hide and seek, duck, duck, goose and tickle wars are also favorites for getting everyone moving indoors as well as outdoors. For some more great ideas for keeping your little one busy read Toddler Activities. 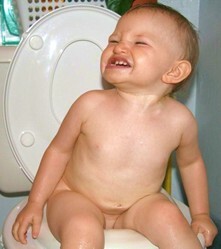 Another great way to eliminate constipation in toddlers is to create and stick to a bathroom routine. Good times to spend some time in the bathroom with your toddler include upon waking, before eating, after eating, before leaving the house, before going outside to play & before bed. Consider getting a potty watch and setting it so that the alarm goes off every hour. Then have a rule that your toddler has to go to the bathroom when the alarm goes off. When your toddler goes to the bathroom, encourage him/her to sit on the potty for at least 10 minutes so that he/she has time to relax and let go. It takes a while for some children to figure out what muscles to relax and which to tense. We have often found that reading our child a book while they are on the potty can help them relax as well as make the bathroom routine a positive experience. If you follow the tips above, your toddler’s health may improve and some of the medication that your child is taking may become unnecessary. Talk with your doctor about how to eliminate or at least minimize your toddler’s dependency on medication. Although following our healthy eating guidelines will provide your child with most of the nutrients her/she needs, it doesn’t hurt to supplement it with a whole food multivitamin for children. Scrutinize the brand you choose since many are loaded with sugar. Our favorites are made by Rainbow Light called Nutri Stars or Kids One MultStars. Dr. Mercola’s Children’s Multivitamin is also great. Since iron supplements are constipating, consider adding organic liver from free ranged cattle or chickens to your diet a couple times a week along with emphasizing organic dark green leafy vegetables. If your toddler doesn’t like liver on its own consider sneaking it into meatloaf and homemade broth, soups and stews. Want to read about which Toddler Training Pants are easiest for your toddler to use as well as leak proof? …Or read about great Toddler Activities to keep you little one busy? …or visit our Natural Parenting Forum to ask questions of the community or tell us the funniest thing your toddler has done recently?